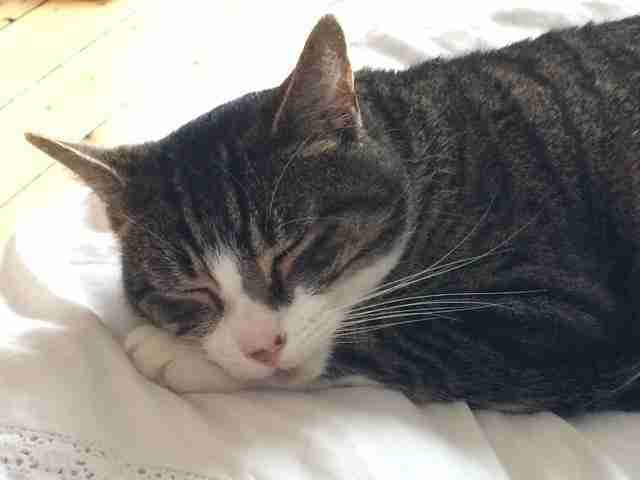 Nearly two months ago, a little cat called Milo helped illustrate how partnerships between animal welfare charities and local agencies can improve animal welfare within the community. As I mentioned in my previous blog, from the outset of the Manchester and Salford Community Cat Project, it has been absolutely key to form effective working partnerships with other local agencies and community groups in order to have the maximum outreach possible. So far, we have formed partnerships with several of these agencies and groups based throughout Manchester and Salford - such as local Trussell Trust foodbanks, the Greater Manchester Poverty Action Group, Age UK Manchester, various Salford Council Neighborhood Teams, Mustard Tree, Inspiring Communities, several Housing Associations/ALMOs and many more. The importance of partnerships came to light in the middle of February this year, as I was driving into Manchester for a meeting with one of these community groups. As I was on my way, I was contacted by Northwards Housing Association, by one of their Housing Officers, who was urgently asking for assistance with an abandoned cat which had been discovered in one of their many properties throughout North Manchester. 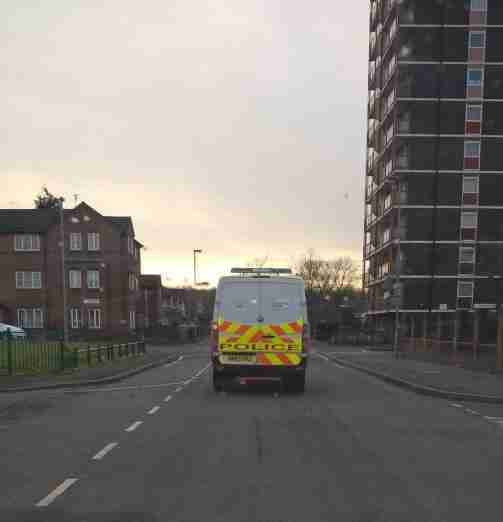 Earlier that day, the Officer had been informed that one of their high-rise properties in Harpurhey had been abandoned. After inspecting it with a colleague, the Officer soon discovered that the previous occupant had sadly left their cat behind to fend for itself. The property had been left in some disrepair, and the food that the owner had left for the cat had run out. After making sure the cat had been fed, the Officer contacted me to see if there was any way I could help. As you can imagine, I was extremely keen to help! However, there is no Cats Protection Volunteer Branch in Manchester, and therefore, we have no rehoming facilities in place to cater for abandoned or unwanted cats. 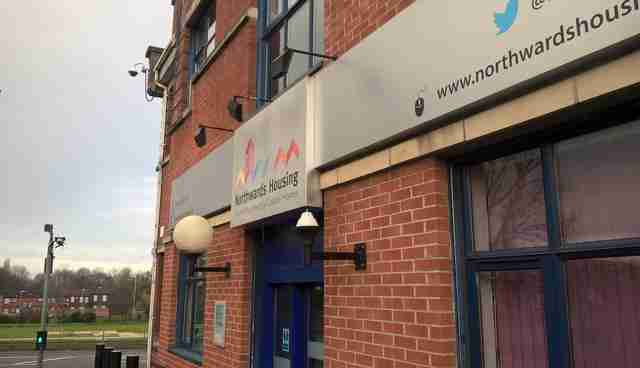 So, after arriving at the Northwards Housing Association Office in Harpurhey and after getting more information about the situation, I soon learnt that the previous occupant had abandoned the property to move to Lincolnshire to start a new job, and had decided to leave his cat behind in the flat. After speaking to the RSPCA National Hotline, with whom I registered the abandonment with them, I contacted the RSPCA Manchester and Salford Branch, who despite being constantly inundated with abandoned and unwanted cats and other animals, immediately agreed to take the male cat into their care. 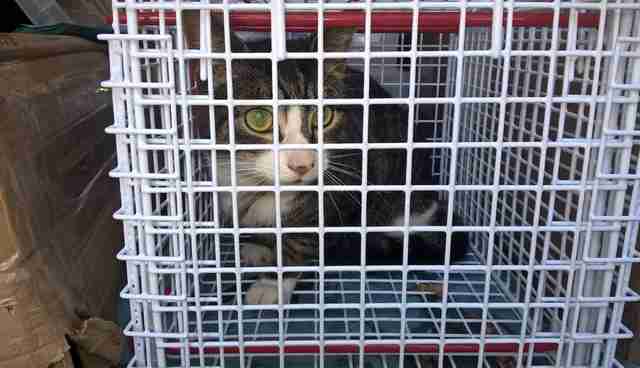 In order to get the cat out of the property as soon as possible, the RSPCA National Hotline had granted me permission to pick the cat up and deliver it to the RSPCA Manchester and Salford Branch. A few moments later, I was on my way to the high-rise property, escorted by the Northwards Housing Officer, who had discovered the cat, and a Greater Manchester Police Officer. After only a short drive, I was granted entry to the property, where I was immediately met in the doorway by a grey and black, mackerel-patterned tabby cat, who instantly started 'meowing' loudly and rubbing up against my legs – not showing any nervousness about the three strangers who had just wandered into his home. After walking through into the kitchen-lounge area, I knelt down to greet the cat, who instantly jumped up onto my shoulders and started to rub his head enthusiastically against my neck, whilst also 'meowing' constantly. After a few minutes of unsuccessfully trying to coax the cat by myself, I was finally able to persuade the reluctant cat to enter into a crusher cage – but only with the help of the Police Officer who had escorted us to the property, who kindly held the cage door open for me as I managed to carefully maneuverer the cat inside without causing it too much distress! I had also forgotten that I was still wearing a scarf, which the cat had taken great joy in clinging onto! After a short journey through Manchester City Centre, with the cat lying down in his cage on the passenger seat, still slightly bemused at what had just occurred, I eventually arrived at a Trafford-based Vet Practice, which the RSPCA Manchester and Salford Branch use. It was at this point where I had to say my reluctant "goodbyes" to the male cat! However, even from the brief time I had already spent with him, it was obvious that he had an infectious personality and was an extremely gentle cat, and as I drove off, I reassured myself that it would not be long before a lucky person, couple or family would fall in love with him at first sight and adopt him! Over the next few days, the RSPCA Manchester and Salford Branch took him into their care, providing him with much needed TLC and veterinary support until he was well enough to be rehomed. 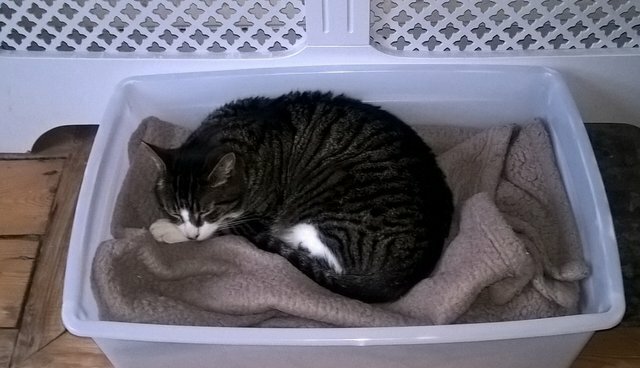 The case of the abandoned male cat in a high-rise property in Harpurhey highlights the potential effectiveness of collaborations and partnerships between animal welfare charities and community agencies and groups - such as Housing Associations – and how these links can help improve animal welfare through a multi-agency approach. Through the Manchester and Salford Animal Welfare Community and Education Working Group, Cats Protection, the Dogs Trust, PDSA, RSPCA Manchester and Salford Branch, RSPCA Greater Manchester Animal Hospital, Blue Cross and Manchester City Council, have made a commitment to work together to support both owners and their pets throughout both cities. In addition to this, we are also forming effective partnerships with a whole range of community agencies and groups, such as Northwards Housing, to ensure that we are able to promote the importance of snipping and spaying and other welfare messages throughout Manchester and Salford. 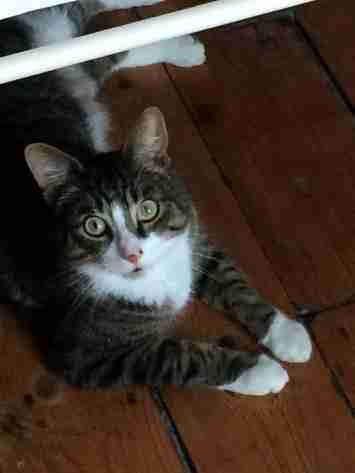 So..."What happened to the abandoned cat from the high-rise property?" I hear you cry! Well, ironically, the case happened to coincide with the fact that I was finally read to adopt a cat myself after a long and mildly torturous attempt to renovate a house. Furthermore, from the moment I had been contacted by the Housing Officer at Northwards, all the way to the point where the cat enthusiastically leapt up onto my shoulders as I was trying to unsuccessfully coax him into my cage, I had a strange feeling this was the cat I had been looking for. Two months later, and as I am coming to the end of this blog, Milo (as he is now called!) 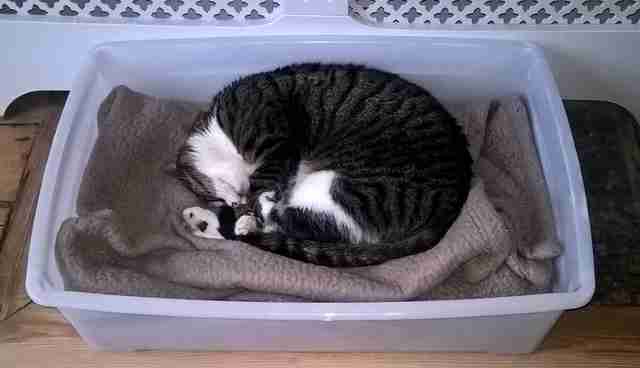 is sleeping soundly behind me, curled up in his favourite basket, on-top of his favourite brown blanket. Without warning, Milo still leaps up onto my shoulder at least once a day, and without fail, settles down to sleep – with me remaining frozen in an awkward, slightly bent-over pose - exactly like he did the first time I met him in the high-rise apartment. When I started working at Cats Protection last year, a colleague of mine once said to me when we were talking about adopting a cat that "I do not need to find a cat – one will eventually find me!" Many months later, and as Milo starts to stir from his sleep behind me just in time for his dinner, I cannot help but feel that in this case, my colleague was most certainly right!